The new Chris-Marine Fuel Analyzer completely changes the condition of the vessel’s fuel system, as it monitors the cat fine level throughout the fuel treatment system allowing precise adjustment of the purifier, corrective action to a homogenizer, or preventive maintenance actions of critical components well before an increased wear level is detected in the main engine. As no other product in the industry the Fuel Analyzer can monitor cat fine level continuously directly in the fuel line – and the result can be seen real-time online e.g. from the superintendent’s office. Precise online monitoring of cat fine concentration (±2 ppm) in up to seven sampling points plus one manual sampling point. Allows for safe and efficient management of your fuel oil system. Up to 10 bar / 140o HFO oil in each sampling point. 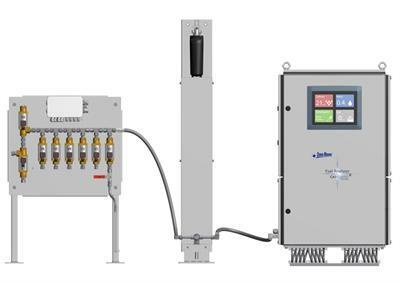 The Fuel Analyzer is self-calibrating and easy to maintain, leading to low service costs and precise measurement results over long periods. User-friendly touch display or remote internet access.